One of the features missing on the iPhone is GPS. I was used to have it on the Nokia N95, and although I didn’t use it very often, it came in handy a few times. Well, the iPhone has Assisted GPS since today. Well, sort of. When checking for new application within the installer, I noticed a new app called Navizon GPS. I have to say it is rather cool. 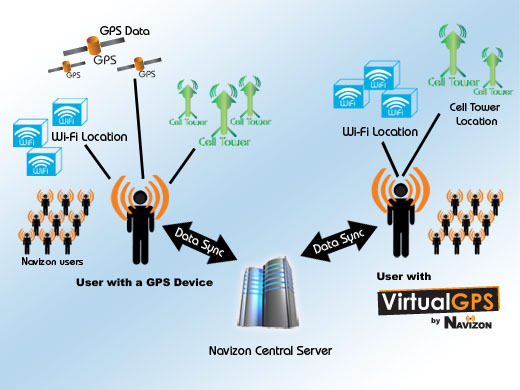 Navizon calls its Virtual GPS service “Peer-to-Peer Wireless Positioning”. It is based on a database which is populated by users of the Navizon software on mobile phones with a real GPS receiver included. The geo-coded information is then combined with the information received from the cellular network and WIFI networks. This combined information is then available for users of the system without a GPS receiver included in their phone. It will in most case never be as precise as real GPS, or even the A-GPS on the N95, but it still allows you to locate yor position in a certain area, as long as the area is covered by users with GPS equipped phones in the past. In my case, the location found by my iPhone was a few hundred meters away from my home here in London. Still very sweet!!! This entry was posted in Apple, iPhone, Tech Stuff. Bookmark the permalink. "Is it still illegal to perform an autopsy on a living person?"